The wonderfully convenient thing about Camera Raw, is that it’s incredibly easy to learn your way around it. Its simple interface and easy to use tools will only take minutes to get the hang of; as opposed to taking many hours trying become barely competent in Photoshop. You’ll see just how effortless it is to retouch your raw photos. So open up one of your raw images in Photoshop’s Camera Raw and let’s get started. A common issue with beginners is wondering which to adjust in a photo first—the colors or the tones? It depends on the image, really, and over time you’ll develop a keen eye for spotting which one needs correcting upfront. For example, a common, but glaring error, is how skin and other light colors becomes too blown out. With your previous knowledge when we discussed the raw vs. the JPEG format, you’ll know that in order to add back the detail into the skin and the hair, we need to adjust the Highlights. Pull down the slider and the detail returns to their skin tones. But then, how do you know which slider to use? Let’s take a look at our tonal range. You can clearly see the different levels of black as we move from one end of the spectrum to another, with 100% Black being absolute black and 0% being White. These two extremes, along with the shades of grey in between, actually correspond to your tonal sliders in Camera Raw. It’s quite obvious that the Blacks slider adjusts an image’s black tone while the Whites slider adjusts the white tone. But what about the rest? In general, pulling down a slider to the left darkens an area and pulling up a slider to the right lightens an area. By playing around with your sliders, you can find that the Highlights slider adjusts the 25% tone and the Shadows slider adjusts the 75% tone. This pretty much leaves us to the Exposure slider, which, by this analogy alone, shows us that it affects the 50% Grey area. Adjusting this slider allows you to use Highlights and Shadows to compensate for any changes you’ve made until you achieve your desired effect. While it might seem blatantly obvious to adjust the contrast slider, we find that this is not necessarily the case. This is because Contrast usually adjusts both the Blacks and the Whites at the same time by making the Blacks blacker and the Whites whiter (pardon the redundancy). It does add contrast to your photo, but we’d like to have a little bit more control over what we want to adjust, instead of having both extremes in the tonal range adjusted at the same time. So to add contrast, let’s just manually adjust the Whites slider and the Blacks slider individually, and voila! These subtle changes have dramatically altered your image from before. If you want to make sure that you balance out your cool blues and greens with your warm orange and magentas, you can turn to the first eyedropper tool on the top portion of Camera Raw that says “White Balance Tool”. What this does is allow you to click anywhere on the image and balance your colors based on the point that you selected. Find something that works for you as a starting point, and then adjust the photo using the Temperature and Tint sliders until you’re satisfied with your work. The most basic thing to remember when making color changes is that the Temperature and Tint sliders, when pulled down to the left, make an image cooler, while pulling these two sliders up to the right makes an image warmer. You can experiment on your own but essentially, you’ll be using the Temperature slider to make the major changes in color while using the Tint slider to fine-tune your retouching. We’ve practically covered all the sliders, save for Clarity, Vibrance, and Saturation. Saturation boosts all colors equally. Vibrance boosts the weakest colors first (those with the lowest saturation), and then moves on with the rest. To understand this better, Saturation boosts the warm colors first before the cool colors, while Vibrance does the opposite—it boosts the cool colors first before it boosts the warm ones. Again, your preference will really depend on the photo you’re working on. Lastly, Clarity affects the contrast and sharpness of your image. Pulling up the slider sharpens an image and makes it look grittier. In beauty or fashion shoots, especially in female photos, you’d usually want to leave the image soft to highlight the attractive features of a woman. But if you’re opting for that grunge effect or something a little bit more artistic, then you can have fun with Clarity. If you have male models that you want to toughen up, you can make them look manlier with Clarity. Just be careful not to overuse the Clarity slider or you’ll end up with some obscure effects. 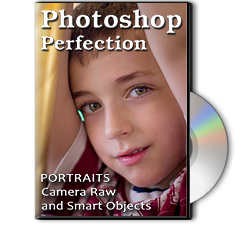 This Adobe Photoshop Tutorial answers the question: How to use Camera Raw? If you would like to learn more about Photo Enhancement from a Professional Retoucher, I offer Adobe Photoshop Classes. Please contact me today, and I will be able to add you to the schedule too. If you would just like to watch online videos, The Art of Retouching Studio offers many Photoshop Tutorials for Beginners and Advanced users.